London is a foodies dream! Don’t worry about what you are going to do while you are here, the most important question you have to ask yourself is: where are you going to eat out? For: quality brunch and coffee, a comfy neighbourhood feel, great music & laid back but efficient service. My friend Tina (Australian) believes this to be one of the best places for coffee in London (and she would know). Gluten free options are available. ££: Very decently priced; under £4 for a coffee and under £15 for great brunch. For: Flavoursome, authentic, modern Thai food. 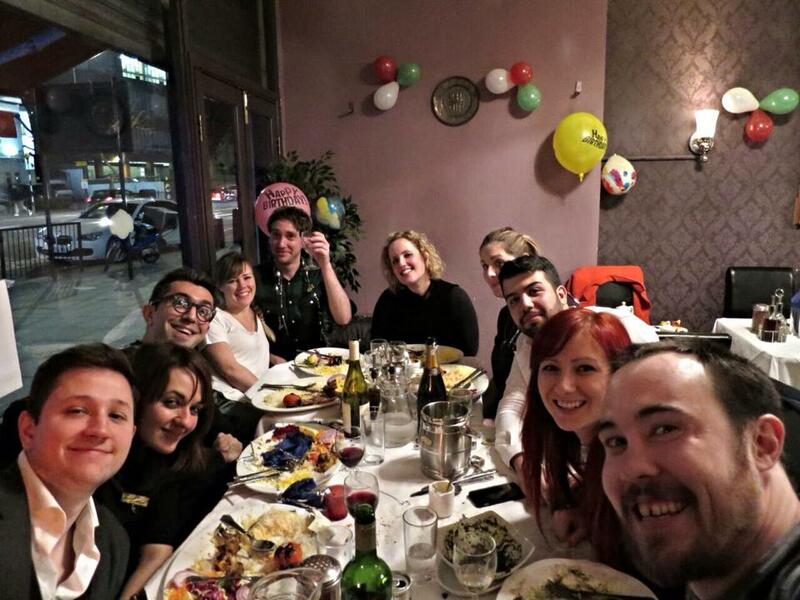 The generous set menu is great for large groups of people – I had my 29th birthday there in 2015. ££: Great value for money. A £19pp set menu comes with a variety of starters, mains and desert. For: A delicious range of signature dishes from in and around India. Forget Brick Lane, Clapham Tandoori is the top pick for incredibly scrumptious dishes that will leave you full but craving more. ££: The food is averagely priced, but well worth it – about £7-£15 for a main. For: Views! Duck and Waffle serves British and European cuisine 24/7, just above Sushi Samba and on the 40th floor of the Heron Tower. With floor-to-ceiling glass walls and food served all day, every day, you can enjoy the amazing views at sunrise, lunch, sunset or midnight. Try the signature dish, Duck and Waffle. ££: Breakfast is £11-15, all day fare is £9-16. For: Turkish cuisine served with fresh food and large serves of hot starters, vegetable dishes, grills, mixed maze and seafood specialities accompanied by a decent wine list. ££: Mains are usually less than £15 unless you are after a steak or specialty dish. Special weekend menus (50% off) apply to some of the restaurants and special lunch time menus (£10 for starter and main) apply during the week. For: Legendary beefy burgers and salty, rosemary-flecked, skin-on chips. You can also enjoy a chicken or vegetable burger and each burger can be paired with a craft beer or cider. There are delicious gluten free options available. ££: Burgers and chips start at £10, but with add-ons, sauces and sides you could stretch to £16. For: Italian restaurants with good and quick service serving fresh, quality food from Jamie Oliver. Pastas are handmade on site and are amazing. The casual atmosphere and homey ambience is a lovely surprise in a big city. There is an assortment of good wine and gluten free options. ££: A large portion of pasta is £10-£13.50, a main is £13.50-£22.50 and the (yummy) famous “plank” for starter is £6.95-£10.50 per person. For: Tasty Persian cuisine and warm and authentic Middle Eastern atmosphere. ££: A starter is around £4-5 with a main priced at £8-15. For: A Vietnamese restaurant with genuinely authentic food, cold Vietnamese beer, mini Vietnamese villages built into the tables, and a busy atmosphere. ££: Great value for money – generous dinner and a drink for 2 for around £25! For: an American barbeque style diner that has fast service, tasty food and a hot wings challenge for the brave. Watch my mates Simon and Luke try the hot wings challenge! ££: Pit cooked Bar-B-Q meals will set you back £12 – £17 while most of the burgers are under £10. For: yummy Japanese ramen (noodles and soup), sake and Japanese liqueur. For: A generous and delicious selection of sandwiches, cakes, scones, teas and champagne (for an extra fee) on playfully mismatched vintage plates, cups and saucers. Always book ahead. 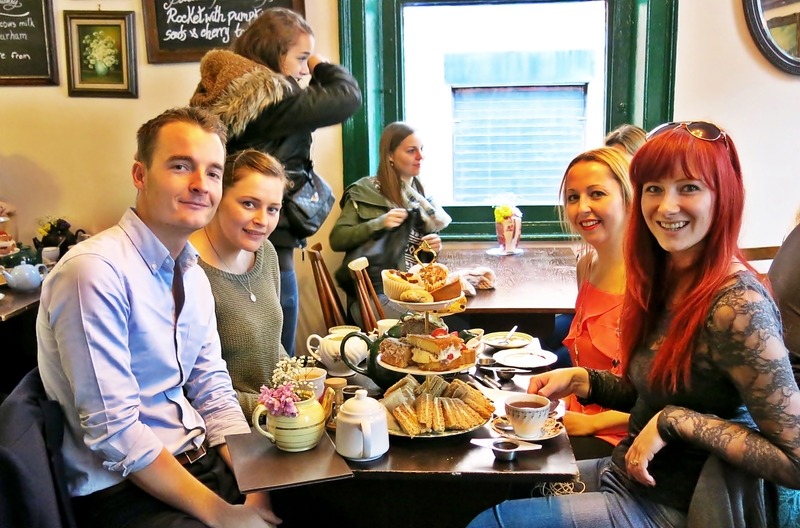 ££: At less than £30 per person, this is the best value for money for traditional British afternoon tea in London. For: The view, cocktails and tasty food! Share tapas-style Japanese-Brazilian-Peruvian sushi on the 38th-floor Heron Tower overlooking London. This is the perfect way to celebrate a special occasion and the cocktails are great! Always book ahead. ££: It’s not cheap. Budget for £30-£60 per person for food, depending on how much you eat. Cocktails are £10-£16 each. For: lively and loud atmosphere, group bookings and awesome curries! The best curries I have tried in London, and better than what you will find on Brick Lane. ££: Very reasonably priced. A very filling meal and leftovers to take home will set you back under £30 for 2 people. 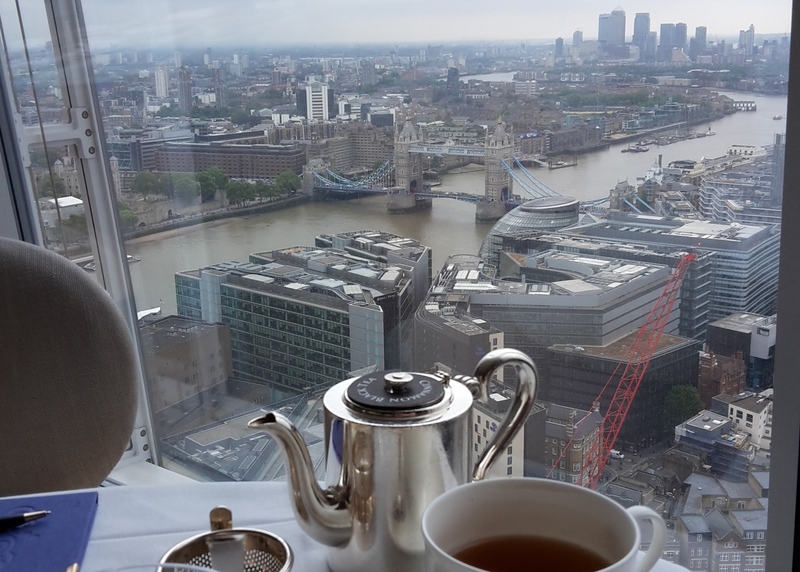 For: Located on level 35 of The Shard, this glass walled restaurant serves modern European cuisine with an Asian twist as you enjoy breathtaking views across London. They also have a nice British/Asian afternoon tea option in the Ting Lounge. Book ahead. ££: It can get pricy (even for London), but it’s great for a special occasion. Starters are £15-£19, mains/grills £20-38 and sides are £4 each. For: Tasty and budget friendly Thai food, noodles and Asian beers in the heart of Soho. With very quick service and a high turnover of tables, it makes for a great place to eat before a show or night out. ££: A main will set you back £6-£10. For: Wines and Yoshuku (Japanese tapas). The restaurant is quite small, seating less than 30 people, and features a large bar with a great selection of cocktails, wines and Japanese specialties. The staff are vey hands on and can help you choose. ££: Wines are £25-£30 per bottle while tapas plates are £3-£13 each and would serve approximately 2 people.